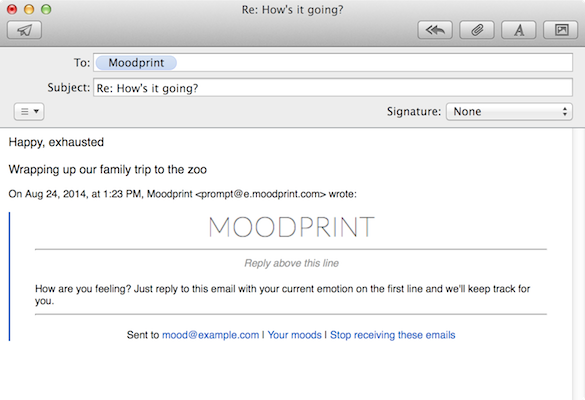 Moodprint sends you email at random times during the day—just respond with how you're feeling. Have mixed emotions? Write them all down, separated by commas, and they'll all be recorded separately. If you want to add some context to your mood recording, just add a note on the line below your mood. You'll be able to see it on your timeline page later. Your data is fundamentally yours. You are free to export it from the system whenever you like, and you can delete your account (and with it, all trace of your data on our systems) at any time. Use charts to detect patterns in your mood over time. 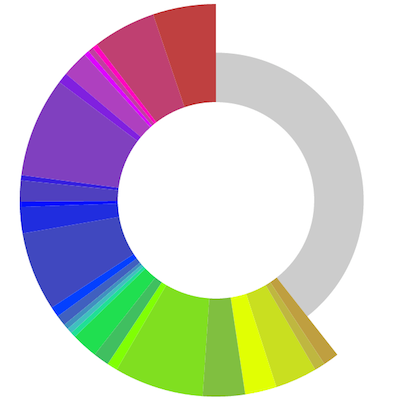 The system categorizes your moods (based on Robert Plutchik's wheel model), making it easy to see at a glance how you've felt for the past day, week, or longer time period. Watch out for our regular summary emails, which bring the charts and analysis to your inbox.